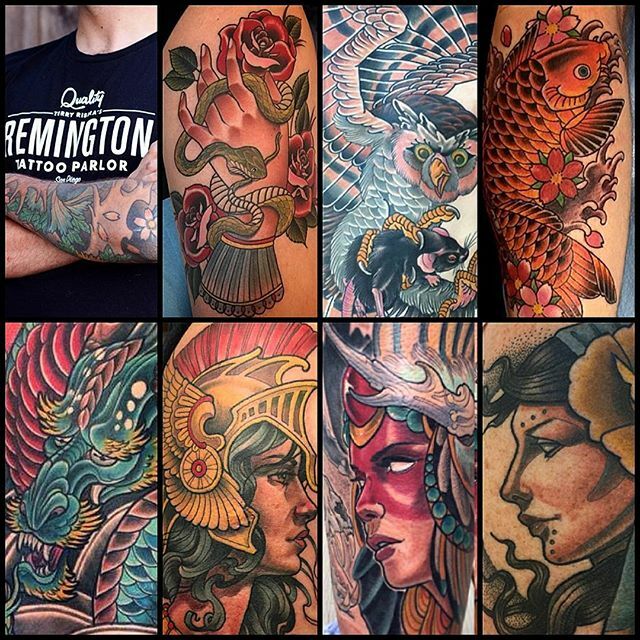 Attention Tattoo Artists: Remington Tattoo is looking to hire one motivated tattoo artist. We are looking for someone with at least 5 years of experience, who draws well and tattoos like they know what they’re doing. You use black outlines, black shading in your color work and tattoo clean…did I mention you need to draw well?? We are going have 1 spot open for the right person who is looking to work with our crew. You can not be an apprentice, or be looking for an apprenticeship, I will not respond to any inquiries about apprenticeships! Currently we have 8 artists at our shop and one of them is taking the next couple of months to transition to a new state. We are going to take our time in choosing who we hire as we have a very family-like crew. We are also welcoming guest-artists and those looking to relocate to San Diego. You are here: Home / San Diego Tattoo Shop Latest Work / REMINGTON TATTOO IS HIRING!